Last year I wrote about when my wife forced me to watch Netflix’s A Christmas Prince…and my wife loves me enough that she has not forced me watch another Christmas movie until this past month. Unfortunately my good fortune ran out and this evening my wife informed me that, for reasons I can’t possibly comprehend, Netflix opted to create a sequel to Yuletide misadventure. And to make matters worse for me, my liquor cabinet is completely out of my favorite whiskey Crown Royal. If you are able to, watch this instead. The movie opens with what could possibly be the exact same stock ‘Christmas in New York’ footage as the first film, but I am too lazy to actually check. Amber is tired of commuting back and forth between New York City and Aldovia, but her occupation is a blogger. The one job that can be done anywhere on the globe that has WiFi access. She could blog from anywhere! I am literally doing it right now on a couch while not wearing pants. And if she is going to be queen of a nation that has a massive luxurious palace, why is she still staying in a crummy New York apartment in the first place? Sublet that Gotham walk-in closet and live like royalty in the castle! She opens each blog post with “Loyal readers…” How many people follow her blog? Is that what I am doing wrong? Should I open each post with “My Loyal Fellow Subjects of Geek-dom…” Let me know in the comments below. Does the King of Aldovia really need his Aldovian passport stamped every time he returns to Aldovia? Does Queen Elizabeth go through this as well each time she passes through Heathrow? Amber’s father has an altercation with an over-the-top character about a cab outside the airport. Golly, I wonder if this character will return to play a larger relevant part later in the movie? These movies rarely ever start off with a chance encounter with a character that later turns out to be the groom’s best friend, scheming family member, wedding planner or something like that. When the palace guy picks her up at the airport, he approaches her and pretty much says “I’m Zabata. You don’t know me, but I am here to pick you up from the airport” and she jumps right in the car. I pointed out in a previous post about how royalty in these films lack even the most basic level of security, but come on! Has there never been a kidnapping for ransom in European history? Why is Amber so amazed by the size and luxury of the suite in the castle that she has visited repeatedly over the past year. If this is the 1st time she is seeing the suite, exactly where has she been staying on previous visits? Aldovia’s finest Motel 6? And did they leave the light on for her? Hey Hey! The Borg Queen from Star Trek: First Contact is back in this movie too! How awesome would it be if the Borg showed up and assimilated everyone associated with this film! And I mean everyone! On-screen “talent”, behind the camera and pre and post production staff. If there were any writers involved, them as well. Here, I bought you a locket. I love you nearly as much as I love Hot Pockets. Golly, the character from the chance encounter at the airport cab earlier turned out to be the wedding planner! Nostradamus couldn’t have predicted that future! The Sahil character is supposed to be funny (I’m assuming) but comes off exceedingly forced and offensive to both Indian and Gay culture. It appears the writers watched The Fifth Element and for some reason thought this guy was the Indian version of Chris Tucker. He isn’t. The token quirky gay friend and sassy black girlfriend are still a staple ingredient in any cheesy Christmas movie recipe and this piece of crap is no exception. So Mrs. Averill is all concerned about Amber’s image now? Has this not come up at all over the past year of dating/engagement? Remember In my previous article when I mentioned that there is always one member of the staff that has the protagonist’s back? Well, apparently Zabata fills that role in this movie. Oh No! Where is all the country’s cash disappearing to? The nation’s department of economics, with their army of accountants, economists and tax attorneys are baffled. Somehow I am sure Amber’s accounting skills, honed from years of balancing the books for Rudy’s Diner in New York, will untangle this tainted evil web of lies. How can this movie be so long without an intermission? Feels like I’ve been watching this spineless King and Queen-to-be getting bullied around by Mrs. Averill and the annoying wedding planner for hours already. Without the benefit of whiskey or some other type of alcohol, I’m not going to last much longer. The King and queen-to-be take a horse and sled to go hunting for a Christmas tree deep in the royal woods where nobody goes, yet there are sled tracks already there. I’m guessing the 1st take wasn’t used in the movie’s final cut. One of the sub plots of the movie (it lacked a main plot) is cousin Simon’s story of redemption. He was the main villain in the original movie but comes back to help save the kingdom. The only problem is the closest thing to a heroic act he did was pick up Amber and her obnoxious friends from a bar. That was seriously all he did. His heroic act of redemption could have been handled by any 3 star Uber driver. Hello. I will be your Uber driver this evening. The sub-plot of the 12-year-old princess and the 12-year-old boy is just weird and awkward. The Royal staff censored Amber’s blog? I thought for sure it would have turned out to be Russian hackers. Speaking of Russian hackers, if any of you are reading this, please hack Netflix and delete this movie before it concludes. The majority of this movie is the King and Queen being bullied by Mrs. Averill and Sahil, the annoying wedding planner. If the leaders of this nation are this spineless, I don’t think they will still be a nation long enough to create a third installment for this franchise. Hey I found some Pinnacle flavored vodka in the back of the cabinet! Things just might be improving for Geeky Daddy! You know how some movies are so awful that they are actually entertaining, this is not one of them. It is not a movie that I’ll be quoting days from now and need to watch multiple times to appreciate. It is simply not a movie that should be watched…ever…by anyone. Did Simon really just pitch the King a Bitcoin pyramid scheme as a way to fix the fictional country’s economy? The workers go on strike, the doors to the theater are locked and somebody unplugged the Christmas tree from the wall power outlet. So with the workers on strike, nobody has the ability to simply plug the power strip back in the wall? Oh no! There won’t be a Christmas this year…unless somebody plugs the Christmas tree back in the wall. The unplugged power strip for the Christmas tree lights and the power socket in the wall have more on-screen chemistry than any of the actors in this movie. Worst use of a dungeon reference. They should have put in the Bud Light Dilly Dilly commercial instead and the movie would have been greatly improved. Is there any place that delivers Crown Royal whiskey? How abut a ‘GrubHub’ type app that delivers liquor? AlcoholHub maybe? I should see about a patent. Every hard working Alovian gets a Christmas bonus this year!!! See image below. I think I’ve seen the priest from the wedding sleeping on a beach in California before. What religion is this supposed to be? How is this movie still going? I swear it has been 7 or 8 hours already. They should have cut this up into like 3 parts..wait..what the heck am I saying. No more please! No wedding, royal or not, should ever include a Conga line. And that includes the wedding of whoever invented the Conga line. Will we all meet again next year for A Christmas Prince: Bun In The Oven? Hopefully not. In conclusion, I cannot in good faith say this is the worst Christmas movie ever made (simply because I have not seen all of them). However I can say in all honesty that this is the worst Christmas movie ever made that I have seen. 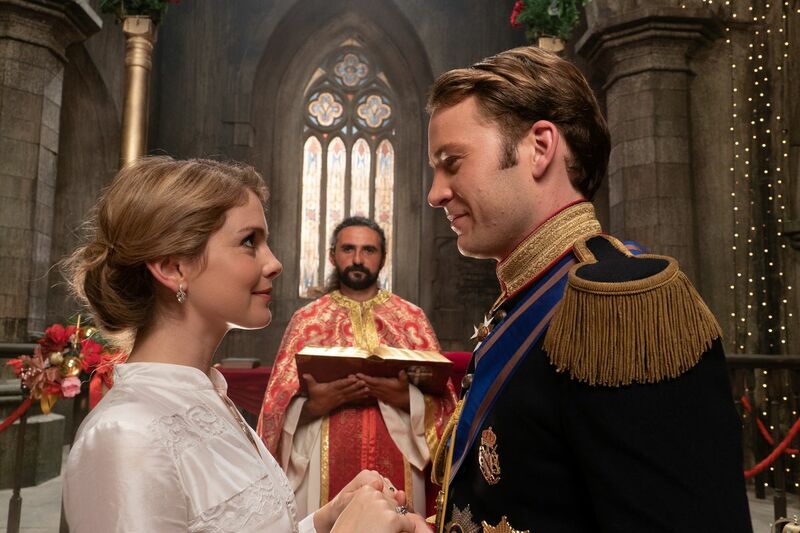 Have you watched this A Christmas Prince: The Royal Wedding? If so, sorry. What are your thoughts on it? Previous The Top Six G.I. Joes You Would NOT Want To Roll Into Actual Combat With. bad? I will watch this one and let you know what I think. Was I too harsh? Maybe, I’d be curious what you think.